Comparison between Standard and Top-Down Entrainment Models. Intrinsic oscillations impose periodic alternations of low (green) and high (red) excitability. The instantaneous phase of ongoing oscillations thus directly impacts on neuronal responsiveness, information processing (colored circles), and behavioral outcome (middle panels: the performance outcome reflects the weighted average of excitability phases at stimuli onsets). Typically, stimuli (black rectangle) induce a bottom-up phase-reset (dashed lines; note, however, that exogenous reset effects are similar for both models and are not represented for clarity). Sine waves depict the behavior of a local, intrinsic oscillator that resonates at a specific frequency (e.g., delta–theta) and constrains (i.e., biases ) sensory processing. Four scenarios of stimulation are presented (rows): (1) aperiodic random (non-predictable), (2) periodic and predictable (at a rate compatible with the intrinsic frequency of the neuronal oscillators), (3) aperiodic but predictable (here, linearly accelerating), and (4) stimulus forewarned by a symbolic cue (‘memory-based’; indicated by hierarchical linguistic tree icon). (A) Entrainment model. 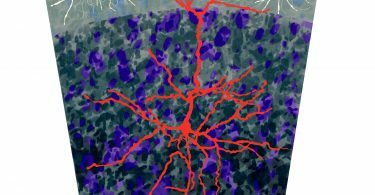 Neuronal oscillations reorganize reactively to stimulation, and are thus directly organized according to the temporal structure of the sensory sequences. Only in the case of a periodic sequence can neuronal oscillations be optimally aligned and thus maximize performance. (B) Top-down reset model. In the case of temporally predictable events (rows 2-–4), top-down predictive signals (black arrows) phase-reset sensory neuronal oscillations before stimulus occurrence, which results in optimized performance. Climbing neuronal activity (CNA) might indicate top-down modulation of sensory processing (row 4) (C) Brain areas that can contribute to exert predictive, top-down control of sensory processing. Abbreviations: AC; SMA, supplementary motor area. The ability to predict when something will happen facilitates sensory processing and the ensuing computations. 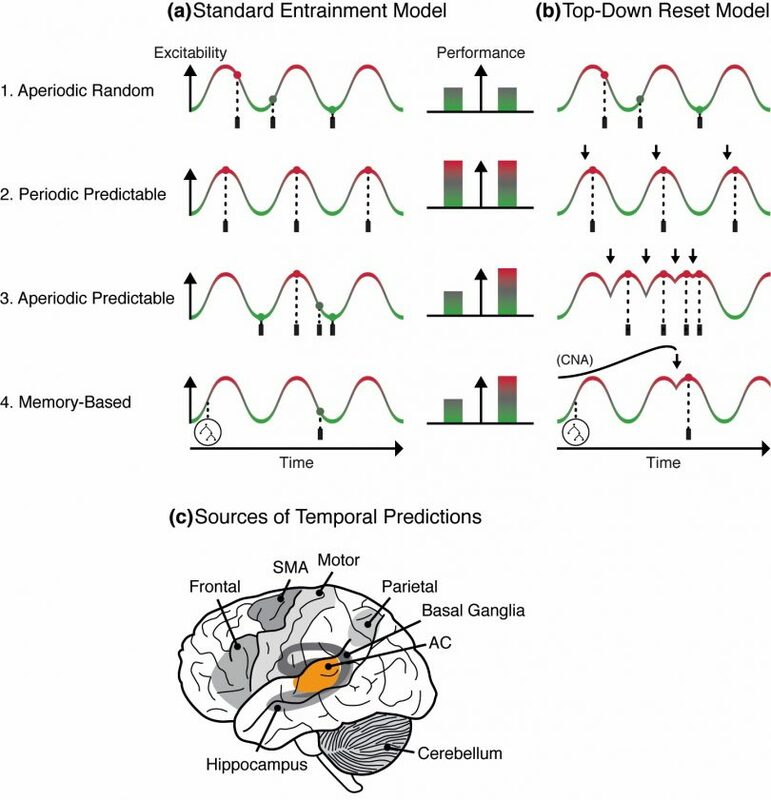 Building on the observation that neural activity entrains to periodic stimulation, leading neurophysiological models imply that temporal predictions rely on oscillatory entrainment. Although they provide a sufficient solution to predict periodic regularities, these models are challenged by a series of findings that question their suitability to account for temporal predictions based on aperiodic regularities. Aiming for a more comprehensive model of how the brain anticipates ‘when’ in auditory contexts, we emphasize the capacity of motor and higher -order top-down systems to prepare sensory processing in a proactive and temporally flexible manner. Focusing on speech processing, we illustrate how this framework leads to new hypotheses. Rimmele, J. M., Morillon, B., Poeppel, D., & Arnal, L. H. (2018). Trends in Cognitive Sciences, Online Publication.